Easter is all about family feasts and delicious dessert treats, like chocolate Easter eggs, cakes, candies and especially cookies! Making Easter cookies to share with your friends and family is a great way to get into the spirit of spring, and decorating these delectable desserts is fun way to get creative in the kitchen. 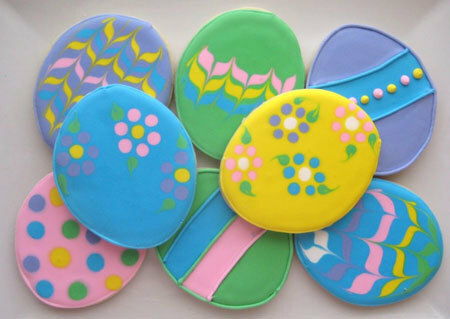 Find out how to decorate Easter cookies! Before your cookies even go into the oven, of the designs you have in mind and use cookie cutters to get a head start – like chicks, bunnies or eggs! Once you’re cookies are out of the oven you’ll want to let them cool for at least a half hour before or else your icing my turn into an eyesore! Hot cookies can melt your icing leaving your dream design a mess. To make icing for your cookies you’ll need a few ingredients and kitchen supplies. In your mixing bowl beat egg whites with the electric mixer until they are frothy. Then add the confectioner’s sugar, cream of tartar and salt and beat for 7 or 8 minutes until peaks start to form in your mix. Cover bowl with plastic wrap and keep at room temperature. You may want to ask your parents to help with this part. Your icing is ready, your cookies are cooled – now it’s time for the fun part! 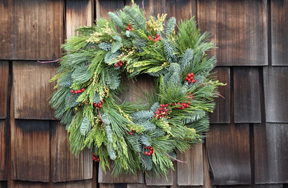 Before you start decorating you’ll need a few supplies at the ready. Divide your icing into different small bowls so you can make many colors to work with. Gently add drops of coloring to each bowl stirring as you go, and keep adding until you get the color you want – pastel pinks, yellows, purple and bright greens are traditional for Easter! Icing hardens quickly, so if you want a color to go on last – for example if you want to make polka dots, draw a face or add a small detail, make sure you cover that color with plastic wrap right away. Using a pastry bag can be helpful to make designs, like lines, polka dots, outlines or small details on top of your base color. 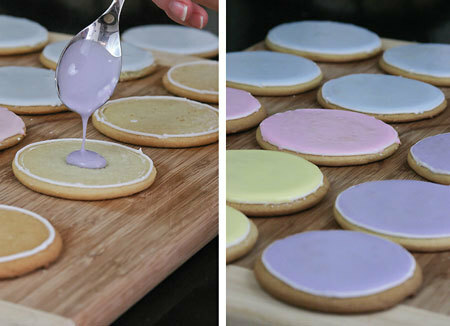 To get an even base coat of color draw an outline on your cookie first and then fill it in with the same color. 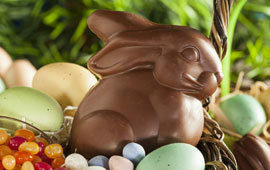 And last but not least, make sure your Easter treats get eaten by giving them to the people you care about! Will you be making Easter cookies? How will you decorate them? Let us know in the comments section below! Kidzworld Kitchen: Easter Eggs Galore!